It is something that prevents someone from concentrating on something else or a task at hand. It is something that takes your attention away from what you are supposed to be doing at a particular time. It is something that diverts someone's focus from something to another. Sometimes, we get distracted while trying to achieve a certain set goal in life which tends to result in failure to achieve our goals in life. So for one to be able to achieve his/her goals in life and also be successful in life, he/she must learn to overcome distraction. To get that desired result in a particular task, absolute concentration is vital and to achieve that you certainly need some privacy. Privacy from friends, family and even pets. Anyone that has your best interest at heart will definitely understand and give you that privacy. Calls, text messages and social media alerts can wait until you finish your task. I bet you will agree with me that our phones can very distracting be it a smartphone or a non-smartphone. So put it on silent for the moment and focus on the task at hand. Our environment is another distracting tool that we need to be mindful of. It can come in form of sounds from the streets or people partying in a club nearby. Try and avoid such environment that won't contribute to your cause unless you have that grace to withstand such environment. Making your intentions known to people in clear terms without compromise is very important if you want to overcome distraction. Making an honest request to people about your intention without compromise is vital. Make them know how important what you are doing is to you and if they want you to succeed they will surely oblige. Avoid any thought that diverts your focus from the task at hand. Negative thoughts like what if, how can, can this be and how possible is this always cross our mind at this moment. The manner you handle such thoughts determines how successful the task will be. One thing you should know is that it's not a matter of working hard but rather it's a matter of working smart. If you do not finish that task today, tomorrow is another day. 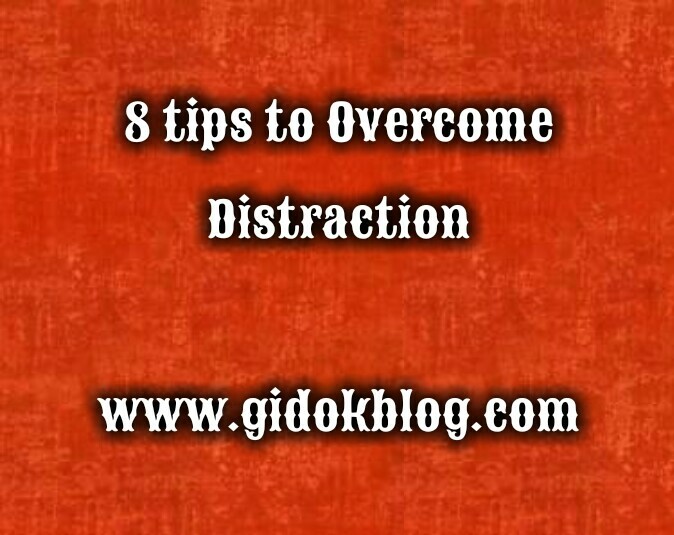 Once you find it so difficult to focus and concentrate, postpone it and continue another day. Internet can be very distracting especially social media networks like facebook, twitter, whatsapp and the rest. If you really need the web to complete your task then put all social media notifications off and use the Internet because a single notification from any of those can make you lose your entire focus. When you feel like loosing your focus after all your efforts to keep focused. Take some time off maybe 20 seconds and do a physical exercise of breathing in and out until the distraction goes away. Do this to get you back on track and focus to complete that very task. If yes do subscribe to Gidokblog below if you are on mobile or by the right direction sidebar if you are on desktop to get latest posts via email. I definitely need to adopt these tips. I'm constantly distracted. Please do cause it can help overcome that distraction. Though turning the internet and putting my phone in silent or away from me would be very difficult, it's still doable. I think those are only what affects me most and sometimes having my own privacy is difficult too. These are great tips! Thanks for sharing. Am happy you find this tips useful thanks for reading through. Such helpful tips! I know my phone can be such a distraction for me. I'm trying to be more aware of the things that hinder my productivity. This is really helpful post! 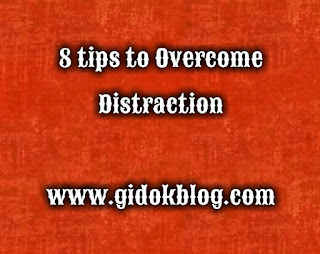 I hate distraction specially if I need to sleep :) thanks for sharing nice blog! Great write as I had to overcome distraction today. Instead of talking to coworkers during break time, I just sat in a room and did work. Super-effective. will definately try and use the same tips. My inner thoughts always distract me. I do think disconnecting from your electronic devices does help a lot with the distraction. You aren't trying to find out what is going on all the time when you do. And that's important. It is so easy to get distracted when having electronic devices around. Whenever I go outside with my boys I have a habit to leave my phone inside so that I can fully interact and enjoy with them. Thank you so much for this. This will definitely help me especially when I need to focus. It's really important to me. This been my issue most of the time. But I am trying to work it out. I've learned that finishing up my work ahead of time makes me more focus and less distracted. I hide away any devices that can consume my time in very unproductive way. Thanks for your tips above. Many people that they need these article like this. I am gonna share this to others. In this world of distractions and noise, these are helpful. There are certainly moments when you jusy want time for yourself in peace. Thanks.